François Hollande promised an “offensive” to bring “more growth and less austerity” to Europe as he launched a bid to resurrect his presidency. Struggling against record low approval ratings and an economy in reverse, Mr Hollande laid out proposals for closer “economic government” of the eurozone, a drive to tackle youth unemployment and a 10-year investment plan for France. Mr Hollande is being pushed hard by France’s European partners – especially Germany – to speed up the pace of reform to reinvigorate the eurozone’s second-largest economy, which has suffered badly declining competitiveness in recent years. 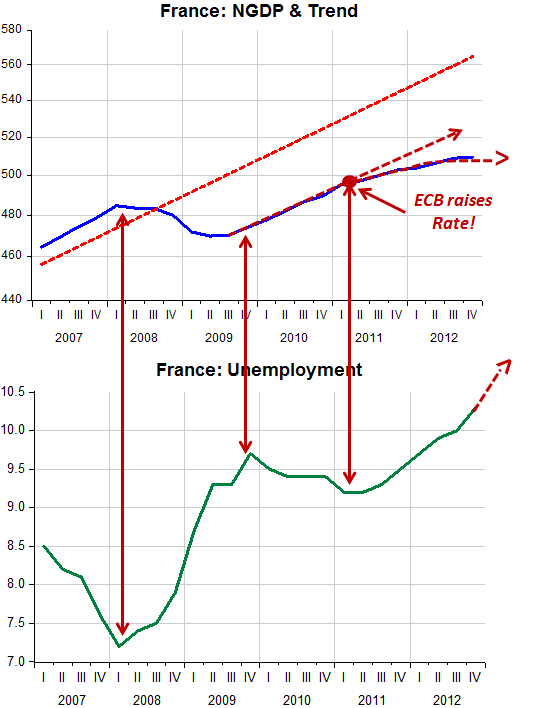 France needs to bring back the franc and let it float relative to the euro in order to target nominal GDP. The euro has been a disaster. Expect riots in summer. Back to May 68 only this time without the students!